Indeed, in order for a business – any business, large or small – to succeed, the service, solution or product it provides must be known to potential buyers. And here’s what it boils down to. Without sales, companies simply crash and burn – and no company makes sales without marketing. Marketing is education. It is the process of teaching consumers first that your services or products exist, second that they need them, and third that they should choose yours over your competitors’. This educative process cannot stop for an instant. Marketing is constant. It builds and builds, and encompasses branding, advertising, public relations (PR), promotions, online and offline content, reputation management, customer service, and sales. What’s more, in today’s digital world, the marketing tactics that you use need to be in an almost constant state of evolution, for that’s what the constantly-connected digital consumer expects. Consider the fact that just a few short years ago it was considered a luxury for a business to have any form of online presence at all. Consumers discovered new products or services primarily through billboard, newspaper, radio or television advertising. Locally, they would consult the Yellow Pages to find the nearest plumber, electrician, mechanic, or somewhere that potentially sold a particular toy for a child’s birthday present – and then they would have to make a phone call. Imagine a business in 2018 trying to survive like that! It just wouldn’t happen. Today, Google is the Yellow Pages of old, and that means that every single business needs a website as a bare minimum – for if your company can’t be found online, it may as well not exist. Indeed, it is. It may be true that practically every consumer these days validates a company’s existence by conducting a quick search on Google – but search itself has become an extremely competitive battleground. Imagine a consumer in a small town who wants to book a surprise holiday for her family this Easter. The local travel agent closed down years ago, so she knows she needs to consult Google to find one – and let’s face facts, even if the agent hadn’t closed down, today, Google would still be her first port of call in any case. So she types in “family holidays Europe Easter”. Here’s what Google returns. 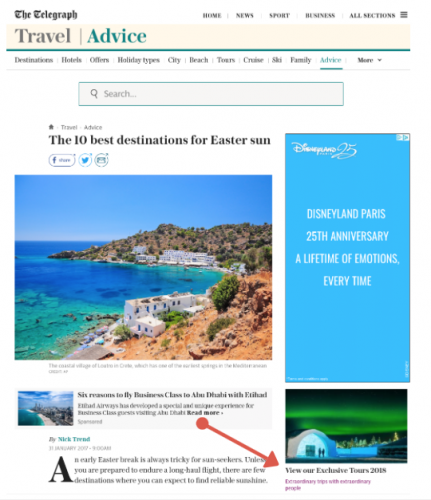 As you can see, it’s not only online travel agencies that are competing for potential holidaymakers’ attentions online, but the national newspapers as well – and The Telegraph takes the top organic spot. 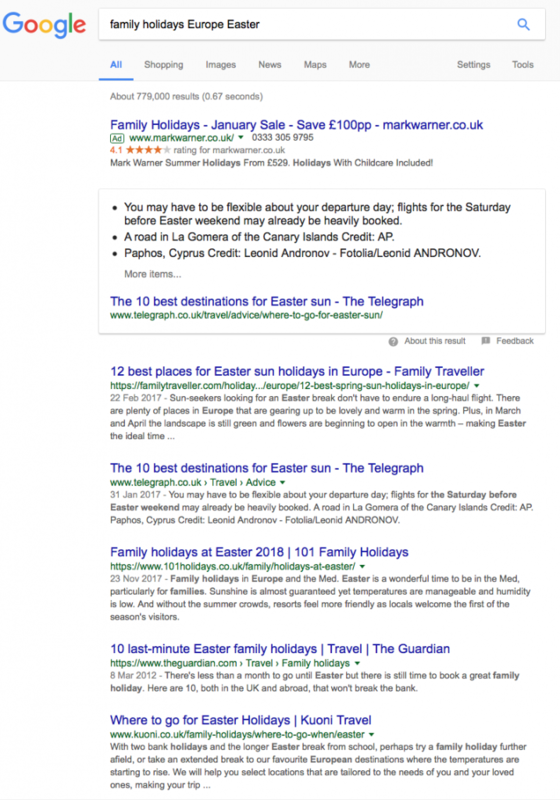 Why does The Telegraph of all businesses want to rank for European family holiday searches? For a number of reasons. First, it wants to sell advertising space to travel companies and hotel/resort destinations – such as Disneyland Paris, as you can see from the screenshot below. Second, because it also wants to sell holiday packages directly to consumers via The Telegraph website – ‘View Our Exclusive Tours’. And last – but by no means least – it wants to promote its Travel section, and by extension The Telegraph as a media product in and of itself. Taking the last point in isolation, this is what’s now known in the digital marketing world as content marketing – but, as you can see, newspapers have been at it for years. Content marketing is the process of creating, publishing and sharing free online material – such as blog posts, videos, infographics, and newspaper articles – that does not explicitly promote a brand, but instead intends to educate and stimulate interest in that brand’s products or services. The Telegraph is not a travel brand per se – it’s a newspaper. But yet there is huge value for the company to invest in creating top-quality travel content – such as ‘10 Best Destinations for Easter Sun’ – as a means to attract consumers towards what it does sell (newspapers, online subscriptions, advertising space, and indeed a few package holidays through its partners). This is content marketing – and it’s what every company should be doing to stand any chance of competing in today’s online marketplace. Indeed there are many, many advantages of content marketing – but, again, you need to be constantly producing educational, informative, relevant, engaging and entertaining content in order to enjoy them. See our post ‘6 Phases of an Effective Content Marketing Strategy’ to find out how to make content marketing work for your business. Of course, we can’t talk about marketing today without paying due attention to the massive impact that the influx of social media has had on the practice. 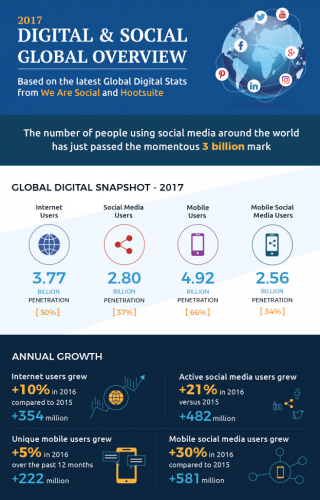 Over the past few years, social media usage has skyrocketed the world over to a point where there are now 3 billion people with a social media account. It’s clear that social media is growing at warp speed – and every business needs to be taking advantage of it if they are to survive. All companies need to be leveraging the power of social media in the best possible way. Not simply because it’s “trendy”, or it’s the “in thing” in marketing in 2018 – but because your target customers are frequenting the popular social networks every single day of their lives. What’s more, they’re engaging with their favourite brands – and the smart brands have strategies to connect with them on many different levels. Social media marketing is all about building relationships. It’s about creating a humanised brand persona, and conversing with customers and prospects in a personalised fashion. It’s about increasing brand awareness, building your reputation, and connecting with your audience where they are. Facebook, Twitter, LinkedIn, Pinterest and Instagram. These are the big ones, and many businesses will do well to build up some sort of presence on all of them. That said, some social networks will be more valuable to certain organisations over others – and so we direct you to our recent post ‘Which Social Networks Should Your Brand Be Utilising?’ to get the low-down on the big five. In the digital world, marketing is always evolving – and marketing strategies need to evolve with them. If we stare into our crystal ball for a moment, it’s not hard to predict what trends we can expect to emerge over the coming months and years. Chatbots will no doubt continue to make great headway – consumers expect to be able to engage with brands right around the clock, and as chatbot technology improves, even the smallest businesses will be able to provide a 24/7/365 service. Mobile, too, will continue to play an increasingly important role for content marketing. 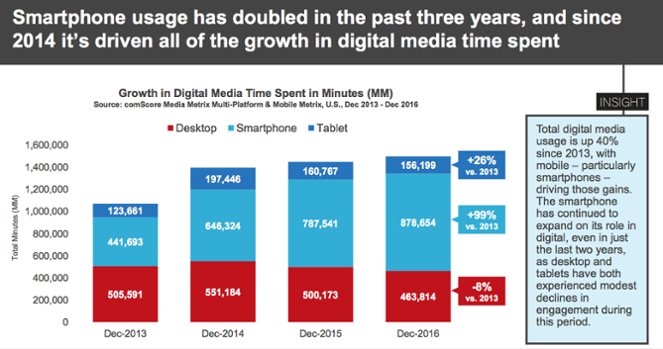 Indeed, recent research from comScore finds that mobile now accounts for a massive 69% of all time spent on digital media. And this means that content marketing materials will have to keep pace and be optimised for the small mobile screen if the publishing brand is going to stay competitive. 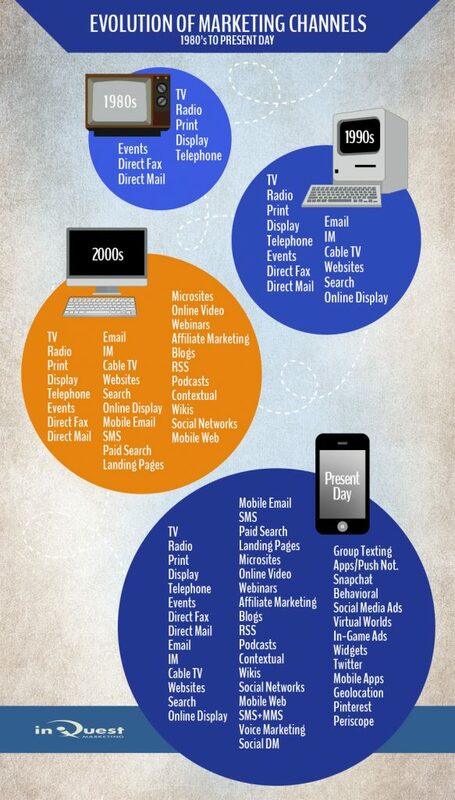 And content marketing itself will continue to evolve – as will the role of the content marketer. Whereas over the past few years it’s been the blog that has dominated content marketing, organisations in 2018 will need to hire content marketing talent with a broader skillset than just writing in order to meet the evolving demands of the modern online audience. Video marketing and other aspects of visual marketing will continue to rise in importance, as will audio marketing. Indeed, organisations will do well to bolster their content marketing teams with individuals with not only writing skills, but video production and editing skills, graphic design skills, photography and photo-editing skills, and audio production skills as well. And beyond all that we can expect the prominence of virtual reality and augmented reality marketing to surge perhaps sometime in the next decade as the technology improves and becomes more affordable. 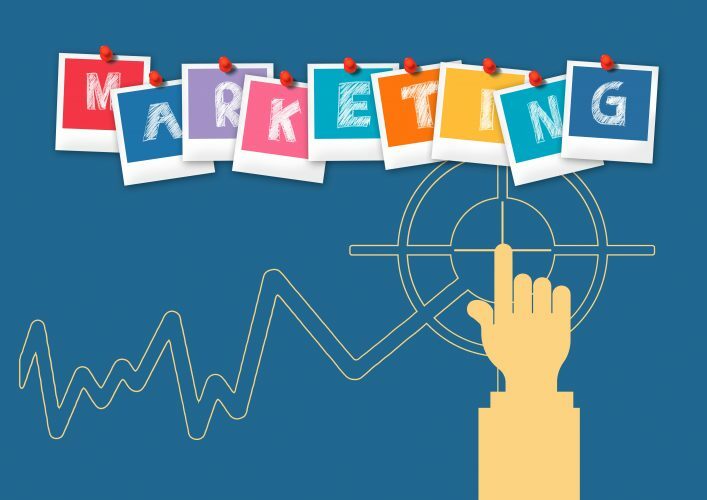 In short, the marketing evolution never stops for an instant, and if you are to continue to educate customers and prospects in the ways they want to be educated about brands and products in the years to come – and thereby continue to make sales – the evolution of your marketing strategy can’t stop for an instant either. If you need help developing and executing a marketing strategy for 2018 and beyond, get in touch with the sales and marketing experts here at Cope Sales & Marketing – www.cope-salesandmarketing – today. Looking forward to hearing from you.